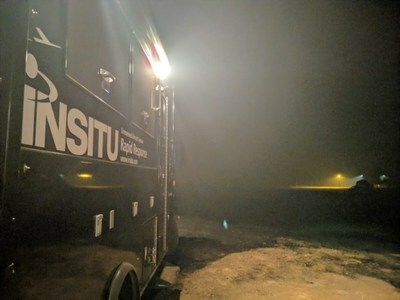 BINGEN, Washington, Dec. 12, 2018 /PRNewswire/ -- Insitu, a wholly-owned subsidiary of The Boeing Company, assisted from the air in the firefight against the Camp Fire in Northern California, now deemed the deadliest, most destructive wildfire in California's history. "Our hearts go out to all of those affected by the terrible Camp Fire tragedy," said Esina Alic, Insitu President and CEO. "We are honored to have had the opportunity to help with fire suppression efforts using our ScanEagle® Unmanned Aerial System (UAS) and INEXA suite of information and analytics tools, and support firefighters in this massive battle." Insitu provided vital information to firefighters with its ScanEagle UAS, and its TacitView™ and Catalina™ software payload. The ScanEagle's camera data and software generated daily operational maps and full motion video detailing the fire's movement. The TacitView and Catalina capabilities are designed to be interoperable with government agency systems enabling domestic remote sensing operations, and the software capabilities are extremely effective in informing firefighters about fire movement in real time. The data provided by Insitu allowed Geographic Information System (GIS) specialists to quickly produce geospatial maps and perform further analyses. Flying at night, when manned aircraft typically are grounded due to safety concerns, the Insitu team flew the ScanEagle UAS beyond visual line of sight (BVLOS) providing perimeter mapping, hot spot locations and points of interest, while disseminating real-time video feed to assist CALFIRE along with multiple local and national firefighting response teams in their daily morning planning meetings. The Insitu Rapid Response team supported firefighters by supplying this data for more optimal fire suppression planning in the extremely rugged terrain of the Paradise, California area. This up-to-date information provided fire incident commanders with enhanced emergency response efforts, increased situational awareness and safety, and supported planning and resource allocation. Insitu's suite of real-time intelligence acquisition and distribution capabilities provide live Motion Imagery Standards Board (MISB)-compliant video and flight telemetry to extensible mapping engines such as the Android Tactical Assault Kit (ATAK) and the Windows Tactical Assault Kit (WinTAK). These tools typically are utilized in defense missions, and now are being widely adopted by first responders for a variety of domestic operations, particularly for use in firefighting operation tools and products. "We witnessed the hard work, dedication and sacrifices made by those fighting the Camp Fire," said Alic. "We are proud to have had the opportunity to stand with these courageous people and play a part in helping to suppress this devastating fire," concluded Alic.